I think that I may seriously need a glitter intervention. I can’t help it! 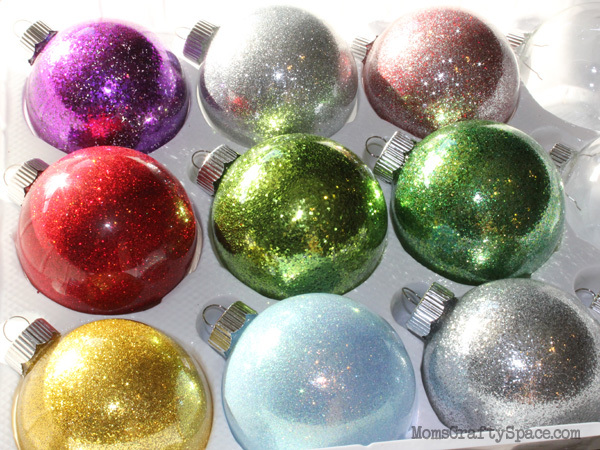 These glittered ornaments are so ridiculously simple to make that I can’t seem to stop! I made nearly two dozen of them today before I ran out of blank ornaments, and now I’m dying to get back to the craft store to get more supplies. I’ve seen this idea floating all over Pinterest in various forms, but I think it can originally be traced back to Everyday Cricut way back in 2009. What you need: clear glass ornaments, glitter (I prefer the look of fine glitter, but regular glitter works just as well) and clear floor wax. Yep, floor wax. I used Pledge with Future Shine from my local grocery store. The process is super easy – pop the hanger cap off the top of the ornament, squirt a little floor wax inside the ornament and swirl it around to coat the inside. Pour the excess back into the bottle and let the ornament sit upside down for a minute until it’s no longer dripping (I put mine into an egg carton to drain for about 2 minutes). Using a funnel or rolled up piece of paper, pour the glitter into the ornament and shake until the entire surface is covered. You can even pour the extra glitter right back into the bottle too. Replace the hanger cap and you’re all done – easy peasy! Seriously. Cannot. Stop. Glittering. Things. 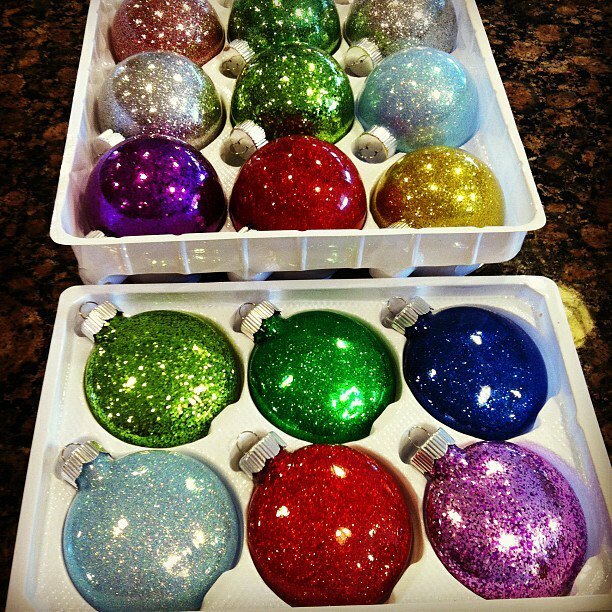 UPDATE: If you loved these glittered ornaments, check out the PERSONALIZED version! This is not working for me! I’m using mop&glow, fine glitter & plastic bulbs. l’ve tried this about 6 times, the glitter does not stick!! I read others directions ,watched videos etc. Can someone help me please!? I really wanted to make these. Sorry, Sharon! I’ve only used the Pledge floor cleaner that I reference in the post, and it has worked fine on both glass and plastic ornaments. Hi! These are beautiful! Now that’s it’s been a few years, is the glitter still holding up? I want to make some keepsakes for some new babies in our family, but want the longevity. Thanks so much!! They’re still holding up great, Kelly! Thank you so much! Let the glittering begin! !